Frank Delaney, New York Times bestselling author of Ireland, Shannon, Tipperary, Venetia Kelly’s Traveling Show, and The Matchmaker of Kenmare, is the unparalleled master of Irish historical fiction, bringing Ireland to life with exceptional warmth, wisdom, and wit. Now, in The Last Storyteller, Delaney weaves an absorbing tale of lasting love, dangerous risk, and the healing power of redemption. “Every legend and all mythologies exist to teach us how to run our days. In kind fashion. A loving way. But there’s no story, no matter how ancient, as important as one’s own. So if we’re to live good lives, we have to tell ourselves our own story. In a good way.” So says James Clare, Ben MacCarthy’s beloved mentor, and it is this fateful advice that will guide Ben through the tumultuous events of Ireland in 1956. The Last Storyteller is the third and final installment in the story of Ben McCarthy and his estranged, Venetia Kelly. The trilogy began with Venetia Kelly’s Travelling Show which was followed by The Matchmaker of Kenmare. Spanning two decades, through these novels, Frank Delaney has given readers a glimpse of Ireland and its rich culture. In this ambitious epic, Ben McCarthy is the main character. Venetia, his estranged wife, plays a larger role in this final book. 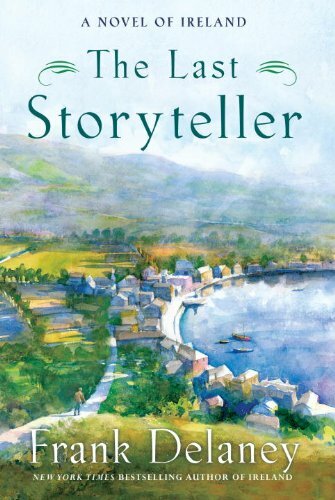 The brilliance of this book and the talent of the author lies in the author’s ability to cover the larger scope of Ireland’s history such as the IRA and poverty while never losing sight of Ben whose own personal adversities evolve as the story progresses and the reader comes to understand his pain, his losses, and motivations. Although I encourage you to read all three of these intriguing novels, each one can stand alone because the author provides a complete background of the story so far at the start of each book. As I read through the stories, Ben MacCarthy, and the journey and adventures in his life, began to feel real to me. The Last Storyteller closes the trilogy with a completely satisfying ending. Frank Delaney is a master storyteller himself. His passion for Irish history is evident on each page that is intermingled with politics, adversity, and plenty of conflict. Never boring, always entertaining, and forever poignant, this was a trilogy on a grand scale. A highly recommended trilogy indeed!